As part of our Travel With Confidence program, we offer you the option of comprehensive Emergency Air Medical Evacuation insurance. This policy will ensure that you can be taken care of in the best possible way and air-lifted to the nearest hospital or clinic which is able to deal with the emergency. Please note that Siyabona Africa does not offer this service and it must be purchased from a reliable travel insurance company. We can assist in recommending the best options to give you peace of mind when travelling. Emergency Rescue Services operate three Cessna 421 air ambulances, one of which is fitted with emergency and life support equipment and on standby 24 hours a day. These aircraft are pressurised and capable of transporting all categories of trauma patients. On board oxygen capacity for ventilated patients is sufficient for flights of up to five hours in duration. 24 VDC to 220 VAC inverters are standard on all aircraft making possible the operation of all emergency and/or life support equipment on board.Aircraft Maintenance Engineers are available around the clock to attend to any aircraft defects whilst designated, trained medical crew ensure the ongoing serviceability, reliability and hygiene of all medical equipment on board. Emergency Rescue Services's 24 hour call centre is based at Polokwane International airport, the base from which aeromedical aircraft and crews are dispatched. Crews on standby during their duty period are obliged to remain within a 10 minute radius of the airport. These crews include paramedics, pilots and aircraft maintenance engineers. One fully equipped air ambulance is permanently refuelled and positioned for minimum delay dispatching whilst at least one other provides backup for multiple evacuations. Subscribed clients enjoy the benefit of immediate dispatching upon call regardless of trauma severity - prior agreements govern payment liability according to medical condition. Critical accident or trauma victims are evacuated to the nearest suitable medical facility for the most critical injury type. 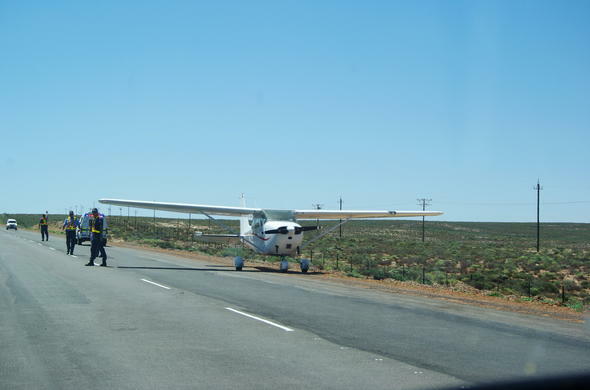 Emergency flights are exempted from the restriction on public road landings. Ground coordinated evacuation from suitable roads, where no landing strip is available, may be undertaken should the situation dictate. On recommendation of attending medical practitioners, it may become necessary to evacuate patients from lesser equipped medical facilities to institutions where a higher level of medical care is available. I.C.U.-level medical care is possible on board Emergency Rescue Services's fully-equipped air ambulances and therefore a much faster and safer transfer of critical patients is possible. Focussing its area of operation on Limpopo and Mpumalanga, Emergency Rescue Services is not allied to any particular medical service provider and remains impartial yet co-operational with all medical service providers in its area of operation. Acting in the best possible interest of the patient at all times is their primary focus and co-operation with a particular medical service provider depends on capability, availability and response time. Using these criteria, Emergency Rescue Services has access to a network of capable, well-equipped and highly-skilled ground-and-air medical service providers in its area of operation. Due to its proximity to neigbouring states such as Botswana, Zimbabwe and Mozambique, EMR is able to provide an efficient evacuation service from these countries to higher care medical facilities in South Africa. It is for this purpose that particularly oxygen facilities on board have been upgraded to allow ventilated transfer of patients during evacuations of up to 5 hours in duration. Emergency Rescue Services operates a 24-hour call centre at Polokwane International Airport, manned by medically trained operators. Correct assessment of potential evacuees' condition is critical. For this purpose, consultation between their medical director or the designated medical practitioner on duty, and the ground evacuation team in attendance at the evacuation site, is initiated immediately. Aviation-experienced operational staff are activated to assist with any necessary flight clearances and other aviation-related matters. These processes continue whilst an air ambulance and aeromedical crews are dispatched to the evacuation site, equipped according to the practitioner's instruction.Constant communication between the air ambulance, DMP, evacuation site, ground ambulance and receiving medical facility is maintained by the call centre through telephone, air band radio, air traffic control centres and cellphone communications. Four Commercial pilots, each with in excess of 2000 hours of flying experience and Four experienced, flight-trained paramedics are on standby according to a roster system, providing 24 hour coverage. The medical director, a flight-and-trauma trained medical practitioner, is responsible for ensuring this 24 hour coverage by suitably qualified medical practitioners.